There will come a time, if not already when words of criticism and concern from others will hit your heart and your mind, and in that moment you must choose how to respond. In ministry and leadership, having to discern between many different voices and opinions and options for decision making is common. Nehemiah had to deal with it, Jeremiah, King David and Jesus had to deal with it. The list goes on. It’s inevitable and Satan loves to use it as an instrument to cause as much pain and division as possible in our lives. I do believe that there are times when people will have genuine and valid concerns that need to be brought to us lovingly and heard and responded to, by us. By lovingly I mean that they love us – they genuinely care about our walk and relationship with the Lord, and they are committed to walking with us on that journey, sharing the burdens. There’s a difference between sharing a concern because they love you genuinely and sharing a concern because they enjoy sharing the concern with you. 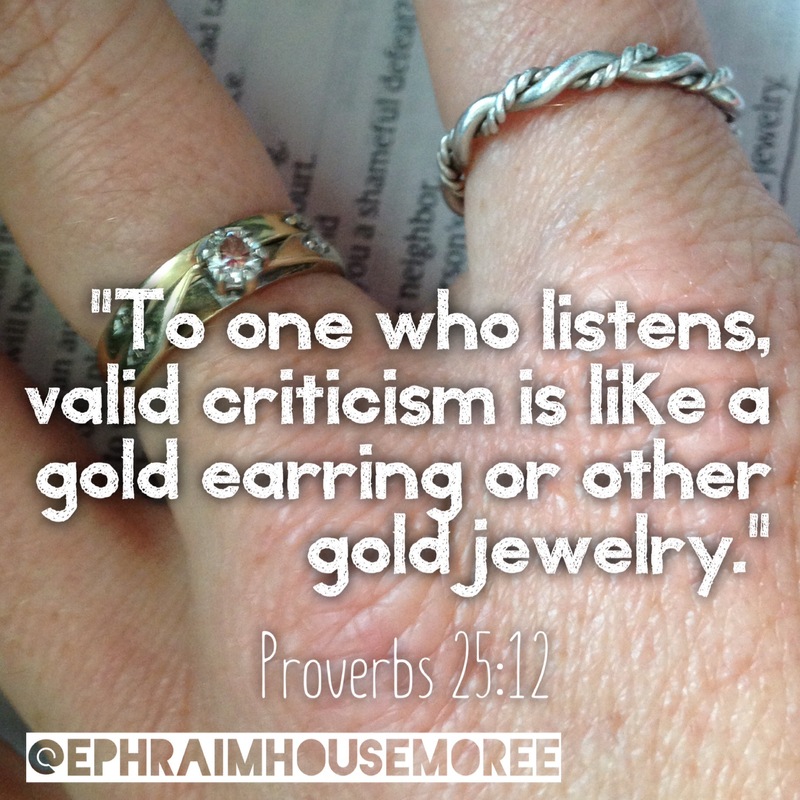 Proverbs tells us that to those who listen, valid criticism is good and valuable. When I was training to be a teacher, one of the catch phrases we often heard was that the 3 important qualities to possess were to be gracious, secure, and teachable (GST) and that our teaching was to be Guided by the Word, Empowered by the Spirit, Motivated by Love & Saturated in prayer (GEMS). I don’t think this is limited to the teaching profession. This is an incredibly powerful ‘equation’ for want of a better word. There’s much to go into there, but for a moment I just want to pull apart what being teachable means. Because the way in which we respond to concern and criticism will define our teachability. Adj. (of a person) able to learn by being taught. There’s been somewhat a morphing of the understanding of what it means to be ‘teachable’. Being teachable is a wonderful characteristic to grasp and live out in our lives and buddies well when crowned in humility. Its incredible to consider that Jesus in all His perfection would still go to the temple as a boy and learn – aswell as teach others. It’s certainly not easy at times to have this attitude. But like all Christ-like characteristics, sin has perverted them and made them into something that they are not. There are many people today who think that if someone doesn’t agree with their idea, theology, routine (even if they claim its from God or Spirit given!) that the person is unteachable. Not true. I believe God requires us to be discerning at all times. True Godly discernment can only be done when empowered by and walking with the Spirit – notice in Luke 2:40 how Jesus was growing? There are many voices in our lives that will compete and stand up against the Voice of Truth. A lie is anything that is not truth – even if it’s close to but not quite the truth. Satan enjoys being a ‘backseat driver’ – putting his two bob in where it’s certainly not wanted. Sometimes he uses well meaning people and plants seeds of destruction in our minds. We have to learn to separate and discern between the destruction (earthly mess) and destructor (enemy of our souls) or we ourselves will be destructed. As a family in ministry we have had waves of concern come over our family at different times during the last 10 years. Some certainly valid and some we have discerned to not be. We realised fairly early on that if we were going to not only survive this Christian ministry walk but be victorious through Christ that we were going to have to have some foundational strategies in place. Strategies don’t promise success or perfection and they shouldn’t take the place of faith, but they help to hedge us in on our path as we humbly walk by faith. 4. Take every concern or criticsm to the cross, and lay it before the God of Truth. Pick up only what God gives you to carry. Jesus is the ultimate burden carrier. Have you heard the song by Casting Crowns, “Voice of Truth”? If not, I hope you are challenged and encouraged by the lyrics.